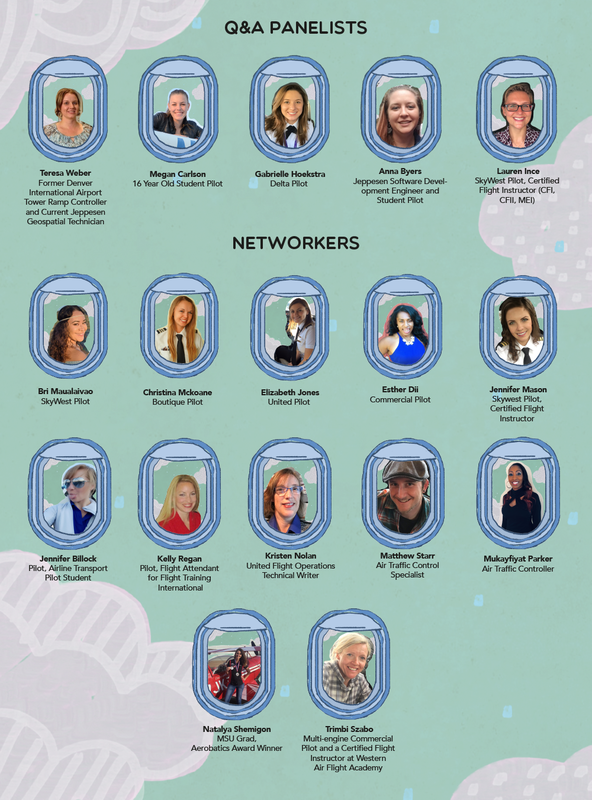 This year we were excited to partner with Women in Aviation International (WAI) for our 3rd annual Mocktail Networking Social on October 26th! Read on to learn about the amazing women who joined us to share their story and network with our high school girls. Ms Anne Kollar is a Pilot for the Wyoming Air National Guard and SkyWest Airlines. She has been a part of the Air National Guard for 13 years and started her aviation track immediately following High School. Anne has volunteered her service for both the Enlisted and Officer side of the Air National Guard. Her first six years in service were as a F-16 mechanic for the Colorado Air National Guard and later commissioned with Wyoming to become a C130H pilot for the 187 Airlift Squadron. Anne has deployed with each Guard Unit once; first in 2007 for Operation Enduring Freedom (Balad, Iraq) and in 2017 for Operation Inherent Resolve (Ali-Al Salem, Kuwait). During her time Enlisted she completed a Bachelor’s of Science at Metropolitan State University of Denver in Aviation Technology. Ms Kollar also flies for SkyWest Airlines and is a First Officer on the CRJ 200 & 700 out of Denver. She continues to express her enthusiasm for aviation with those around her by volunteering for air shows, speaking at events, and mentoring new pilot candidates for the Wyoming Air National Guard. Thanks so much for your support! 2nd Annual Mocktail Social - THANK YOU! On Tuesday, Oct. 17, dozens of professional women in STEM and high school students gathered for an evening of inspiration & networking over empanadas and Wonder Woman themed mocktails. In addition to mentoring and networking activities, attendees got to have fun in a Wonder Woman photo booth and have their formal headshots taken throughout the evening. This year's keynote speaker was Katica Roy, CEO and co-founder of Denver-based Pipeline, a SaaS company that leverages artificial intelligence to identify and drive economic gains through gender equity. Katica is driven by a passion to eradicate economic inequality and champions the rights of refugees, women, and children. See her full bio here. Thank you to everyone for coming out and being a part of our community. Special thanks to Jesus & Victor Hernandez of Aloft Xposure for volunteering their time and skills to take professional headshots during the event. Finally, THANK YOU to our event sponsors - we couldn't have done it without you! Do your regular Amazon shopping at the link below, and Amazon will donate to Girls in STEM!